‘How’s the training going?’ Lots of people kindly ask. 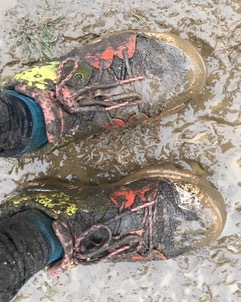 Well, the trainers speak for themselves….mud, mud and more mud. The last few weeks have been one big mudbath. I guess the dates on the calendar should have served as a warning. Two cross-country runs in the hills in winter. It was never going to be a doddle. It’s worth it. Days before the trail run, I met up with the charity LLST – who I’m raising money for – to hear more about the people who receive vital legal support when they’re in crisis. Some of the advice centres and projects supported by the trust are long-established, others are newer, responding to more recent social injustice. Era (not her real name) was suffering from panic attacks, black-outs and nightmares. A victim of trafficking and forced to become a prostitute, the twenty-something year old was too scared to go out alone, despite newfound ‘freedom’. Era’s backstory is all too common. Brought to the UK on a false hope of stability and secure work, she was trapped into a life of forced prostitution. According to the National Crime Agency illegal trafficking has risen significantly in the last couple of years. Thankfully, Era escaped after discovering the door had been left unlocked. ATLEU is a new charity, providing legal representation for victims of trafficking and labour exploitation. When Era came to the charity she had nothing but a legal label of victim of trafficking. No money, nowhere to live. Once the government had assigned her the victim tag she was left stranded by the council. The specialist knowledge that the legal charity’s lawyer could provide transformed Era’s life. The legal case was successfully made for the council to provide a safe place for her to live, enabling her to get a job and plan for an education she never had. What if Era hadn’t had access to a lawyer? What if that lawyer hadn’t ‘got it’? Only an expert (yup, let’s reclaim that word) can understand how best to go the extra mile, how to secure her rights. The official estimate on trafficking victims is thought to be conservative. For many years I volunteered to visit women in Holloway prison, in the last few years I started to see more women with similar but different trafficking, prostitution, forced labour experiences. When you next pass or visit the nail bar offering knock-down prices reflect on this, ask yourself what might be lurking behind the offer. Ask yourself what the personal cost may be to the nail technician. Specialist legal charities like ATLEU and law centres offer a lifeline when other avenues are exhausted. LLST support this vital work. I hope you’ll support me, supporting them. Thank you again.